Hi, Guy, Tim (and all). I have, what I believe, is an original of the Philadelphia Inquirer, Saturday July 4th, 1963. 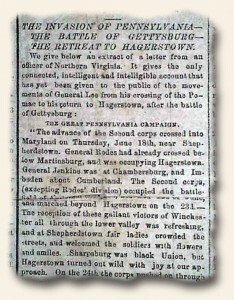 For history buffs, this edition was the first to publish a map of the battle and details pertaining. The Inquirer did reprint the same cover for the 150th anniversary—I am certain this is not one of these reproductions. I haven’t managed to find a whole lot about this collectible online. Does anyone know of it’s significance? Or who or where I can reach out to to find out more.